The MailboxValidator Laravel Email Validation Package is an easy to use Laravel package which enables Laravel users to validate emails with just a few lines of code. This package is using MailboxValidator API to do the validation, therefore you must sign up for the API key. Just go to https://www.mailboxvalidator.com/plans#api to sign up for the FREE API plan and you’ll be given an API key. Finally, you need to add your MailboxValidator API key into your env file. 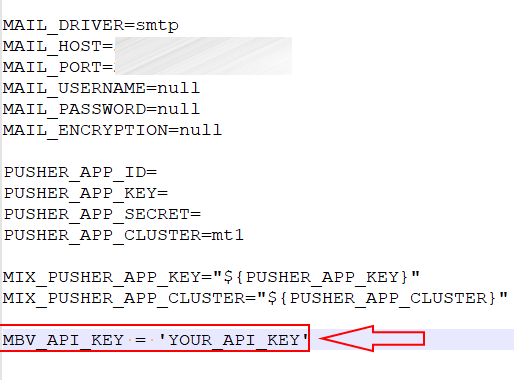 Open your env file and add a new line with the field name ‘MBV_API_KEY’ and assigned your API key into it. Now you can try to open your registration form and enter an disposable email address. An error message ‘This is a disposable email and should not been used to register.’ should appear after the submit button was clicked.